NEW YORK (Bloomberg) -- Tesla Motors Inc., the electric car company that hasn't posted a profit, raised $226 million selling shares above its forecast price range in the first initial public offering of a U.S. automaker in a half century. The maker of the 84,000 euro ($105,000) electric Roadster that is sold in at flagship stores in London, Munich and Monaco sold 13.3 million shares at $17 each Monday after offering them for $14 to $16, according to Bloomberg data and a Securities and Exchange Commission filing. The California-based company will use proceeds to pay for factories and possible acquisitions, the SEC filing showed. The sale came after at least 35 companies worldwide postponed or withdrew IPOs since the start of May as the European debt crisis sent the Standard & Poor's 500 Index down as much as 14 percent from its 2010 high. Tesla, which raised 27 percent more than it originally sought, will start trading Tuesday on the Nasdaq Stock Market under the ticker TSLA. The automaker had boosted the number of shares it was offering Monday to 13.3 million from 11.1 million, according to an SEC filing. Goldman Sachs Group Inc., Morgan Stanley and JPMorgan Chase & Co. of New York, along with Frankfurt-based Deutsche Bank AG, led Tesla's offering. He has spent more than $70 million of his own money on Tesla while selling about 1,000 Roadsters to film stars such as Brad Pitt and George Clooney, musicians and battery-car advocates. 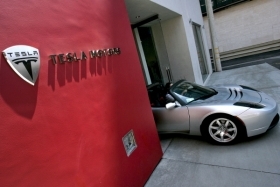 While the automaker has burned through $230.5 million in cash and posted losses in every quarter since it was founded in July 2003, Tesla attracted Toyota Motor Corp., the world's largest automaker, which planned to buy $50 million of shares alongside the IPO. Tesla and Toyota said they may cooperate on electric-vehicle development, though they haven't signed agreements to do so, filings show. Mountain View, California,-based Google Inc.'s founders Larry Page and Sergey Brin, the government of Abu Dhabi and Daimler AG are also investors. Tesla will use the IPO and the federal loan to develop its lithium-ion battery-powered Model S, a $57,400 electric sedan intended to travel 160 miles (257km) per charge, by 2012. The company plans to produce at least 20,000 units of the Model S each year. Under terms of the federal loan, Musk and certain affiliates must retain 65 percent of their stock in Tesla for a year after completing the Model S project. Musk's divorce proceedings won't result in the combined stake falling below 65 percent or have a material impact on his ability to serve as CEO, according to filings. Nissan's electric Leaf hatchback, which has a range of 100 miles, goes on sale in Europe and the United States later. The starting price with incentives in Europe will be about 30,000 euros, or about one-fourth the cost of Tesla's Roadster. GM plans the U.S. debut of the Chevrolet Volt plug-in electric car in November. The Detroit-based automaker is preparing for an IPO that may sell 20 percent of the Treasury's stake in the company and reduce the U.S. to a minority owner, two people familiar with the plan said last week. Nissan CEO Carlos Ghosn said the automaker has received more than 20,000 orders for the Leaf globally, and is prepared to build as many as 500,000 electric cars annually by 2012. Japan's third-largest automaker reported revenue of $81.1 billion in its fiscal year ended March 31.